We carry premium Tonewood: Bosnian maple and Italian spruce. We take two trips a year to Italy and the Balkans, to select the wood. After examining thousands of backs, taps, neck blocks and rib stock, every piece is carefully selected. Our final choice represents about 10% of what we examine. 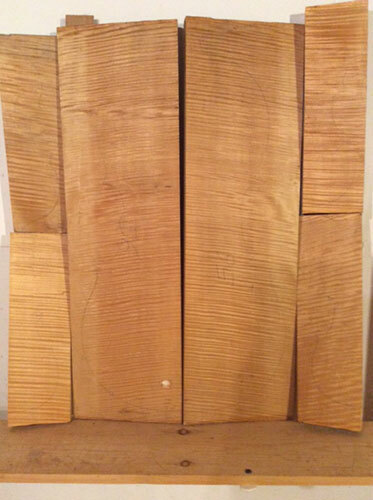 Maple is supplied in sets: one piece or two piece backs including a neck block. Each wedge usually has enough material so that violin makers can cut the ribs from the thicker side. This also provides a good match of the ribs to the backs. If the thick part is not enough, the rib stock will be supplied. Due to a major shortage of premium aged spruce, the spruce is not sold separately. It may be acquired only when purchasing the maple sets. Tonewood is only air dried. Seasoned bass bar wood is also available. All spruce is carefully quarter cut or split. Maple is quarter cut; slab cut is available. The age of the wood is 10 to 25+ years. Makers specify their preference: flame type and width, grain width and the wood is selected accordingly. Nobody gets stuck with what they do not like! Any piece may be returned for replacement or refund.